The most anticipated movie in Hollywood history, “Star Wars: The Force Awakens,” opened Thursday night, sending frenzied fans into the stratosphere. “I was kinda hyperventilating and started to cry in the theater before the credits even started,” Kelsey Ledford, a 26-year-old web developer from Los Angeles, told TheWrap after the first Thursday night screening at the AMC Century 15 in Los Angeles. Just how big of a “Star Wars” geek is she? “Well, I just moved into this new apartment and I already themed half of the rooms with ‘Star Wars,'” she said. Costumed fans also included Kris Carter, a military doctor about to be deployed to Japan who came dressed as the Wookiiee Chewbacca, and a Darth Vader named James Pickens who serves the dark side of the Force by day as an attorney. Ben McGill, a self-described “Star Wars” fanatic who came to the theater dressed as R2-D2, said he was so anxious he had a hard time concentrating at work. He made the droid costume himself, which he said took him “just a couple of nights” to complete. Asked what the geekiest thing related to “Star Wars” he’s ever done, his girlfriend, dressed as C-3PO, pulled out “Star Wars”-themed cookies in a plastic bag, which they baked especially for the occasion. The movie’s Thursday night screenings, jam-packed with die-hard fans, grossed a record $57 million, fueling speculation that “The Force Awakens” could shatter the previous $208 million record for an opening weekend gross set by “Jurassic World” in June. A lot is riding on this reboot. The seventh installment of the outer-space saga is the first sequel since Disney purchased Lucasfilm from George Lucas for $4 billion three years ago. Directed by J.J. Abrams, the story takes place 30 years after “Return of the Jedi” with another battle brewing between the forces of good and evil. 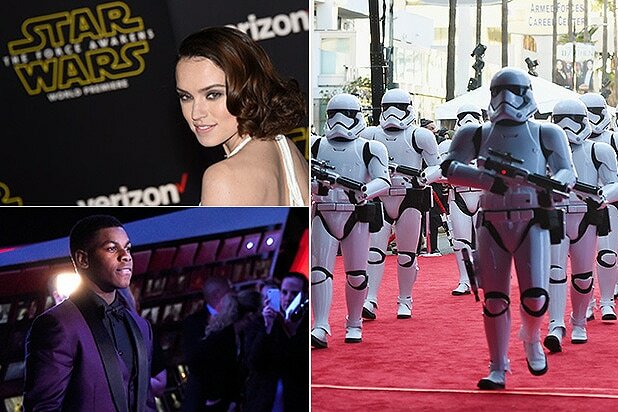 “The Force Awakens” has another thing going for it: a mix of stars from the original classic films, including Harrison Ford, Mark Hamill and Carrie Fisher, and newcomers Daisy Ridley, John Boyega, Lupita Nyong’o, Adam Driver and Oscar Isaac. The prospect of witnessing the return of the original gang was almost too much for some excited fans to handle. “I consider myself a true second generation,” said Sean Cahill, a security safety manager from Los Angeles. Cahill was introduced to “Star Wars” by his father as a little boy. It was love at first sight. Like most people at the screening, Cahill has already bought tickets for another four showings and said he’ll probably see the film a few more times after that with family and friends. Disney is betting on fans like Cahill to make “The Force Awakens” the highest grossing movie in history. The movie opens in virtually every country in the world this weekend, except for China, and global grosses could hit more than $500 million in the first three days.